The other day, I was looking at images of my sister Jordan’s living room. Jordan hired Jenny of Little Green Notebook to assist with the interior design. Jenny lives on the opposite coast from Jordan, but offered up her services via email and phone. Jordan loved working with Jenny and the room looks terrific. I was just thinking how cool it is that getting interior design help is so accessible these days. After the jump, I’ve listed some other drive-thru design services that have shown up in my inbox lately. They offer professionally coordinated looks for your kitchen and bath. They offer a quick and easy way to create a polished children’s space with a reasonable price tag. Kari wrote to me about how they sent a 2-person team to remake her room with things she already owned. You can see a video clip here. What do you think? Have you ever used any of the new interior design services? Would you like to try one? Also. Totally unrelated, but how do you like this image with a glossy coating on the ceiling? I can’t decide if the ceiling is glamorous, or if it feels like a giant mirror over the bed. I’ve always been my own designer and have enjoyed the process, but I’m wanting fresh eyes in my home, so I’m using Holly Mathis Interiors to help me with a few details. It’s such fun to see what someone else would do and to bounce ideas off of someone with great taste. I really like the online concept. Its fun to send images and ideas back and forth until we love something! I used Kelly + Olive (http://www.kellyandolive.com/) and they were great. It was all long distance with phone and email, but they had fabulous affordable ideas and it’s really pulled together my master bedroom and bath. I used Reichel from Copy Cat Chic (http://www.copycatchic.com/) and really enjoyed the experience. She works with lower end budgets and will provide links to the items that she has selected for your design. Love her and her blog! There are some great sites that offer affordable mood boards, and consultation helps via email and phone. Fresh Nest (http://freshnestdesign.com) and Young House Love (http://www.younghouselove.com) are two really great resources! This is what I love about interior design. I work as a decorator in NY, but at the moment most of my clients are in California and Canada! It’s been a lot of fun to work with people from all over. I have fun searching on their craigslist for deals and helping them with either a full room re-vamp or working with them on a one hour consult to just tie up loose ends. It makes interior design much more accessible. Went to check out the ceilings you posted. Not loving the high gloss in the white. It just looks too glossy, but I loved it in that lime green. With the addition of color it looked a bit tamer and more doable. The bedroom ceiling would be creepy, I think. But I could see doing the painted glossy color. I like Jordan’s apartment, it looks great, but still real. I can appreciate good design and have a whole file of rooms I love. But for the life of me, I can not create these rooms myself! I’m filing these links away for my next house! Thank you! The gloss over the bed makes it look like you’re not sure if you are looking into a pond and seeing the sky, or its the sky itself! Makes the height look endless. I love it. I love your sisters living room! I love looking at Jenny’s blog; she has fab tips! I am with you on the ceiling, but would love to try it in a kids room with a colored paint! Never used an interior designer – but that and a personal trainer things I’ve day-dreamed about! Eww. No. I do not like that ceiling. I’m probably not the best to ask though- I prefer beadboard! Love your sister’s living room. Super cute! Love that Red shelf under the TV. Is that something she painted herself or she bought it somewhere? Good taste runs in the family for sure! I’ve never used a design expert as I’m lucky to have my hubby — an industrial designer who specializes in interior architecture and marketing. I have a few years of design school under my belt too. Most of the time we can collaborate in a good way. Other times I wish he would just go with the program! I would love to do some kind of design by redistributing my existing items. I love the idea of someone advising virtually, but don’t know that it would work in a redistr. situation. Regarding that mirror-ish ceiling – holy claustriphobia. Mirrors generally open up space because of how they reflect light, but in that scenario, it feels like the ceiling is pulled down closer to the floor. As a decorator by trade, I love this new trend. For years now, I have helped people via email and fed ex sending paint swatches, graph paper, carpet samples, etc… It’s a great way to make decorating more accessible and less intimidating! Although I’d rather help in person, in the actual room, there is something nice and easy about sending off the plans and letting someone else complete the project. P.S. I love the glossy ceiling. It made my heart skip a beat. Not loving the white above the bed…it’s a little creepy. 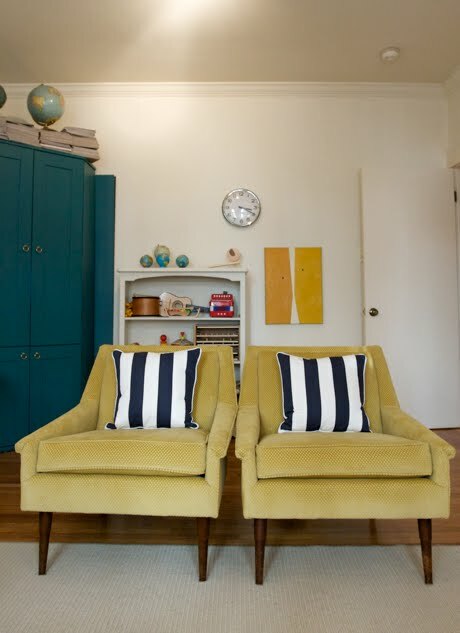 Surprisingly, I like the yellow in the other room. I couldn’t do that stretched vinyl ceiling; yes, mirror-like. The glossy yellow paint is classy, though it would make my textured bedroom ceiling look like meringue or something from a bad sci-fi flick. This is a bit off topic, but can anyone recommend a colorist for exterior paint color. We are painting our house this summer and I am quite overwhelmed with choices. The house was built in 1908. I love the idea of accessing a great designer from another part of the country. Thanks. Hey Julie — I’m an interior designer/color expert and would be happy to help you with your paint color selections…! *I’m also mentioned in the article above as I just launched children’s design to-go… But I do lots more than that! I’m in NYC and would love to help. Shoot me an email at michele@lavenderandplum.com. Never used one, but if I did I would so use John and Sherry of YHL–I love all their stuff and their price is right (I think $250 to design one room but I could be wrong). I love Jordan’s room, too. Comfortable and still interesting…fun yet cool. I also am very, very excited by the idea of long-distance design services. What a great way to make use of technology and gain a wider base of possibilities from both a client and designer perspective. As someone who is contemplating trying to make a career change into becoming a designer, this idea has a lot of appeal. Greater ease of working at home which matches well with having a family, and being able to cast a wide net. I can’t believe I didn’t hear/read (or grasp it if I have come across it!) about this sooner. Thanks, Gabby!! As for me, I think playing with texture and different types of surfaces is always a neat way to add impact and interest to a room. I would say, though, that for me personally, I wouldn’t do it in a bedroom, and I definitely prefer the color version to the white version. How about that cool black basement you featured (was it yesterday? )…I wonder how it would look with a low ceiling…could be cool. For some strange reason (maybe it’s the colors?) for me, glossy ceiling in the bedroom = mirrors over the bed. Glossy ceiling elsewhere = cool. I LOVE THIS! I have been looking for decorating/design ideas for my new living room. This helps me out oh so much. Thank you for posting this. BTW, I LOVED the pictures of your sweet June! I especially love the 2 of her 5 siblings surrounding and loving her. What a precious moment to capture. Really great to seeing everyone’s responses to “interior design to go” – we love the trend too and think it’s great that people everywhere, not just those living in larger cities and towns, now have access to great interior design help. Our fellow Chicagoans, Kelly + Olive, do a great job, and if you haven’t heard of Betsy Burnham’s Instant Space, that’s another great resource. Thanks, Gabrielle, for including us in your post and LOVE your sister’s living room! 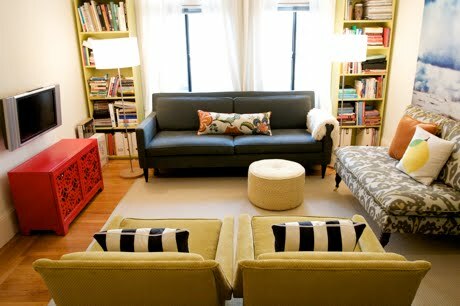 Is that little Ikat settee the Nate Berkus one? Great color palette. As for the glossy ceiling…not sure I’m loving it. Makes me feel like I’m under water- not in a good way. Love glossy walls though! Great trick for dark apartments, we did it in ours – it bounces light all over the place. Best thing about Interior design is that it is universal… everyone wants a comfy elegant space that represents their own personality! Second best part of interior design is technology.. what would we do without the easy access to our clients?!!! arrived here from wired search. Your POV had become a little famous. Might want to participate there so they can talk to you better and you can attract more readers. I really lucky to find this web site on bing, just what I was searching for :D also saved to my bookmarks. Thanks so much for the mention. We had a great time working with Kari. She is delightful! Love your blog! (But not the glossy ceiling in a bedroom.) :-) Keep up the awesome creativity! I just would like to give a huge thumbs up for the great info you have here on this post. I will be coming back to your blog for more soon….